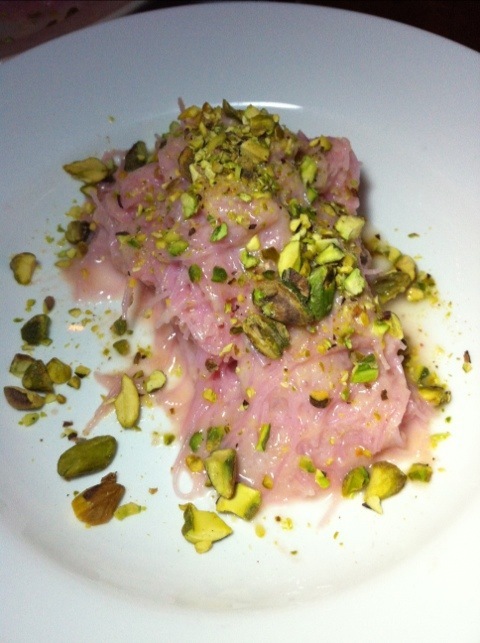 Persian sorbet made with rosewater, rice noodles and pistachios. Quite a compelling dessert – quite tart at first with the rosewater behind and the pistachios finishing. This was a difficult pairing but I went back to the Reissdorf Kolsch – the floral fruitiness of the beer contrasts with the tartness and dances with the rose. This dinner was a treat to attend – thanks to chefs Louisa Shafia (author of Lucid Food) and Jessica Wilson (of Jimmy’s No 43), Jimmy Carbone & the staff of Jimmy’s No 43. Mahi – stuffed fish with tamarind, parsley and coriander, served with Sabzi Polow (saffron rice) and Mast-o Musir (yogurt with shallots). 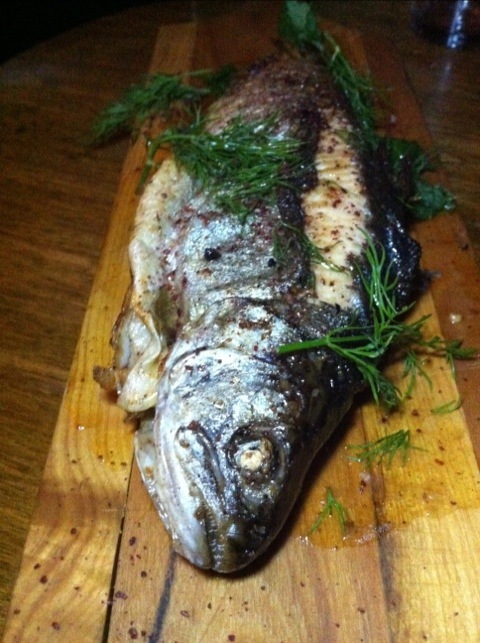 The fish is delicious, quite delicate in flavor, and the stuffing is tangy & nutty. 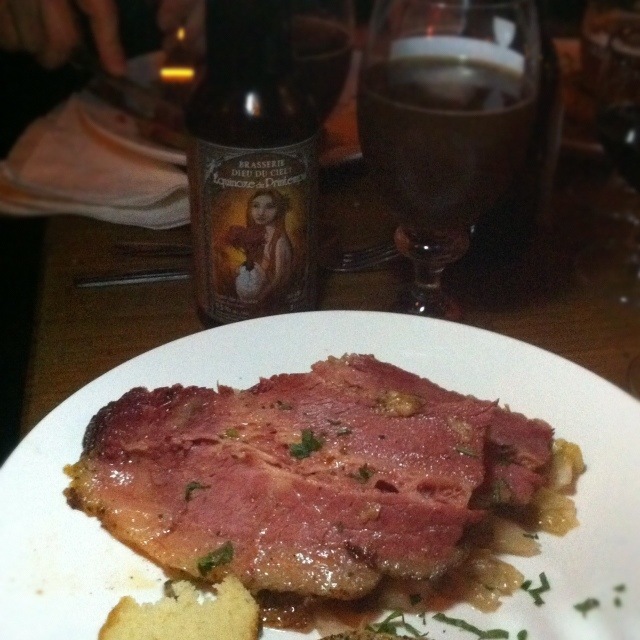 The Ithaca Ground Break Saison works well – the fruitiness contrasts with the stuffing, yogurt & rice. This is a lovely dish. Ash-e Reshteh – noodle soup with beans, herbs, caramelized onion. 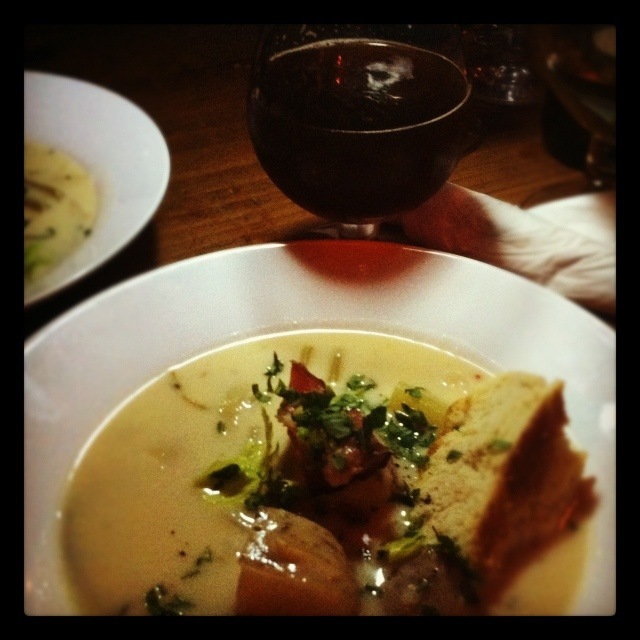 Quite nice with the Barrier Barnacle Brown – the sweeteness of the beer marries with the caramelized onions while the dark malts emphasize the earthiness of the dish. 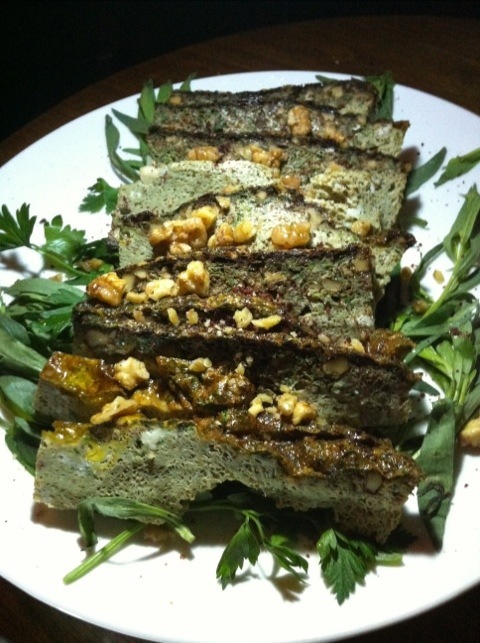 Herb Kuku – baked eggs with herbs, walnuts and dried rose petals. 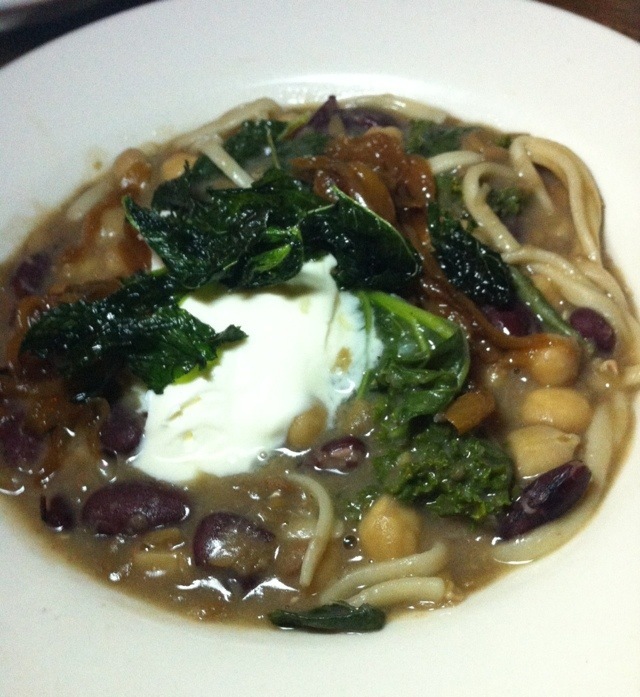 This is an interesting dish – I initially didn’t know what to think but am warming up to it. It pairs nicely with the Barrier Cycle Saison. Nowruz is the Persian New Year dinner. 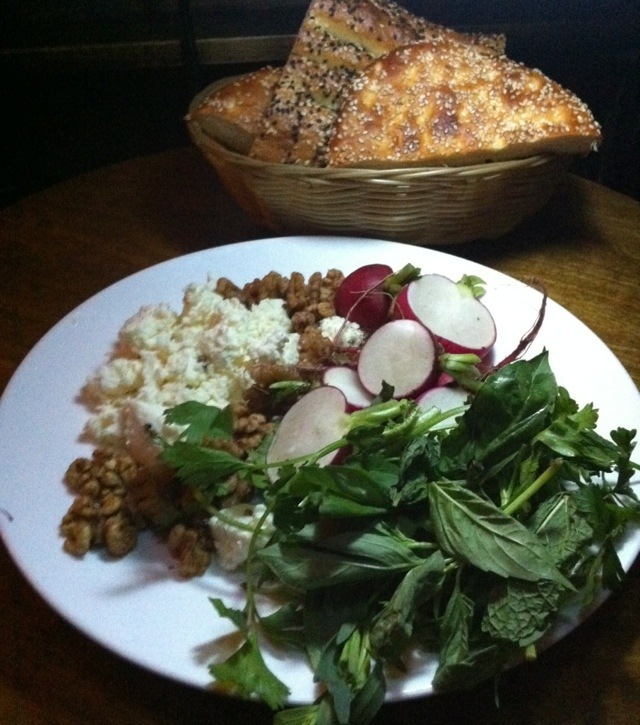 We’re starting with Sabzi Lhordan – flatbread from Hot Kitchen Bakery served with feta, walnuts, mixed herbs & radishes. Delightful with the Reissdorf Kolsch. Duck Proscuitto wrapped figs stuffed with blue cheese, speared with dates & served on sundried tomato ancho chili coulis; paired with La Trappe Quadrupel. 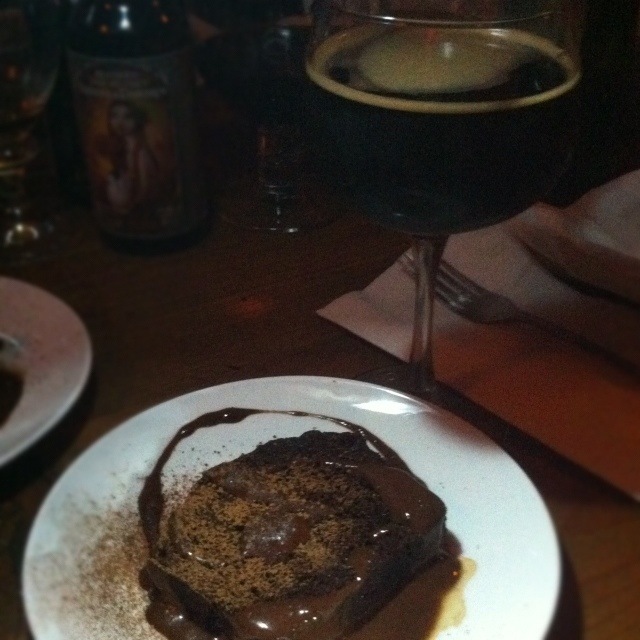 This is one harmonious pairing – sweet, rich and boozy and set off nicely with the earthy coulis. 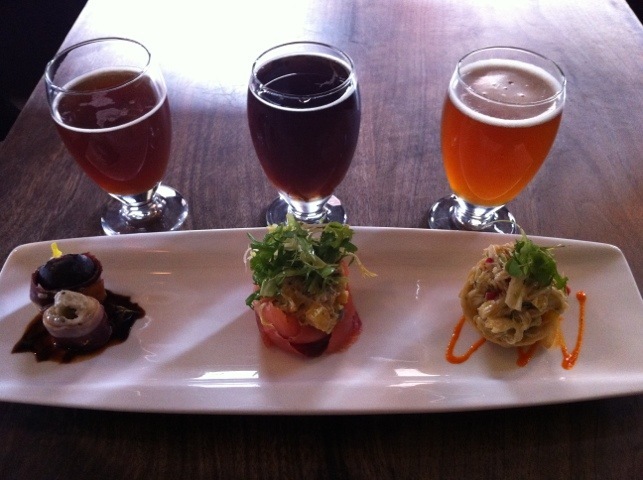 Smoked beet, smoked goat cheese, smoked almond, & smoked olive timbale wrapped in smoked salmon, paired with Schlenkerla Fastenbier. This is a sweet, creamy and lightly smoky bite that is light & refreshing in the mouth. 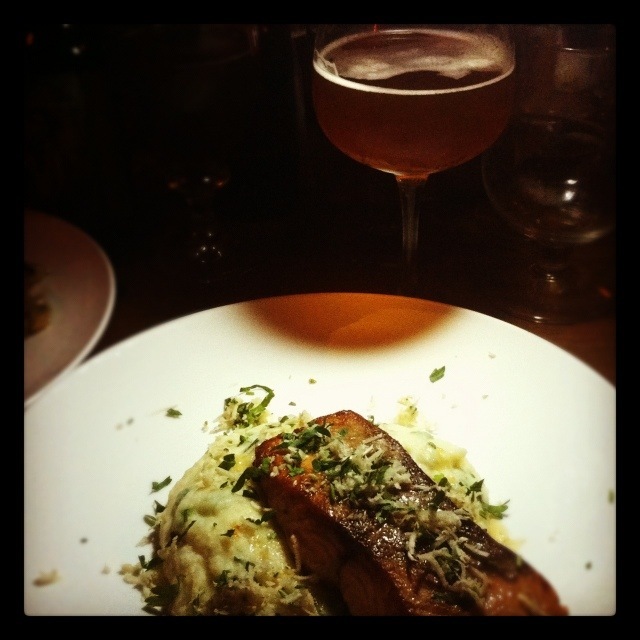 The Schlenkerla is its shadow – a dark, meaty smoke that brings out the nuttiness of the almonds & the sea of the salmon. Caribbean crab salad w/avocado, mango, roasted red-pepper sambal in a fried wonton crisp topped with micro greens, paired with Orval. Oh, sweet & lovely crab meat frolicking in a tropical wonderland. The Orval lays a funky path with each sip and leaves me wanting more. 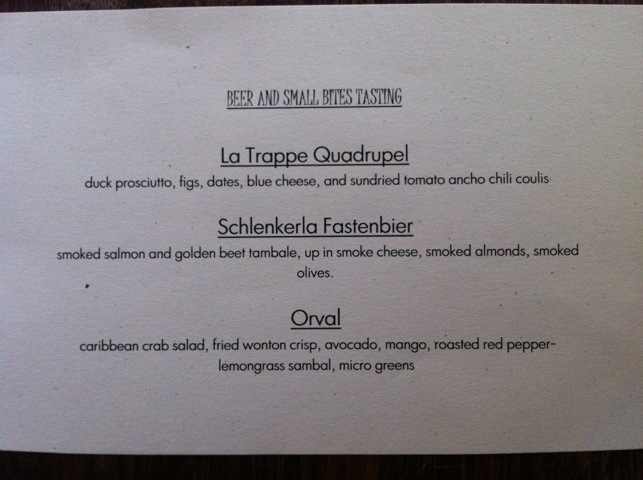 This was a lovely pairing – kudos to chef Tommy & the Blind Tiger crew! I hope to see more of these in the future. 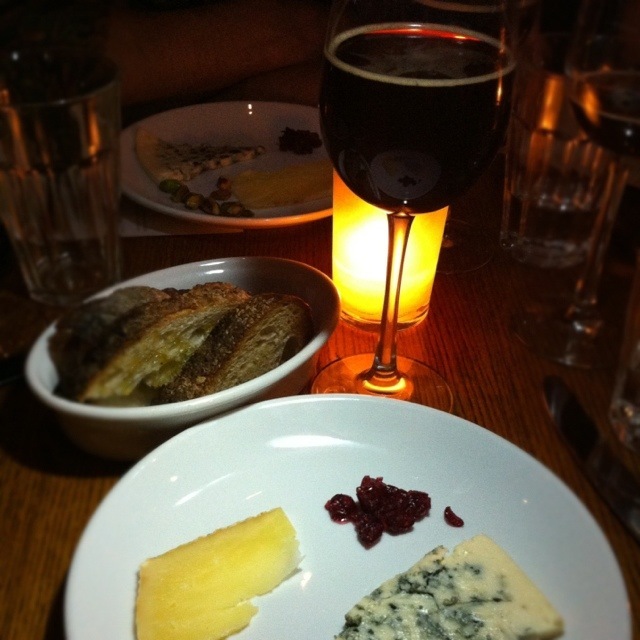 Cuzme & Mary: the Toma Celena is dry, sharp & slightly funky & brings out the rich coffee-like roastiness of the beer while the sweet, creamy funkiness of the Blue Affinée calls to the fruity, chocolate acidity of the Lights Out.